Hydroponic growers who really want the best of the best choose CANNA AQUA. 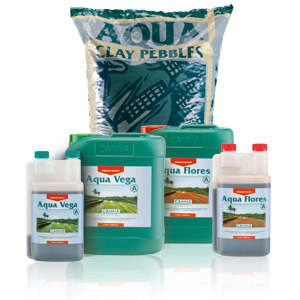 The CANNA AQUA range of products consists of the nutrients CANNA Aqua Vega and CANNA Aqua Flores and CANNA Aqua Clay Pebbles. CANNA Aqua Clay Pebbles are baked clay pellets that form an ideal substrate for strong root development. They are ideal for growers who want to control the application of nutrients and the humidity level of their plants throughout the entire cultivation process.